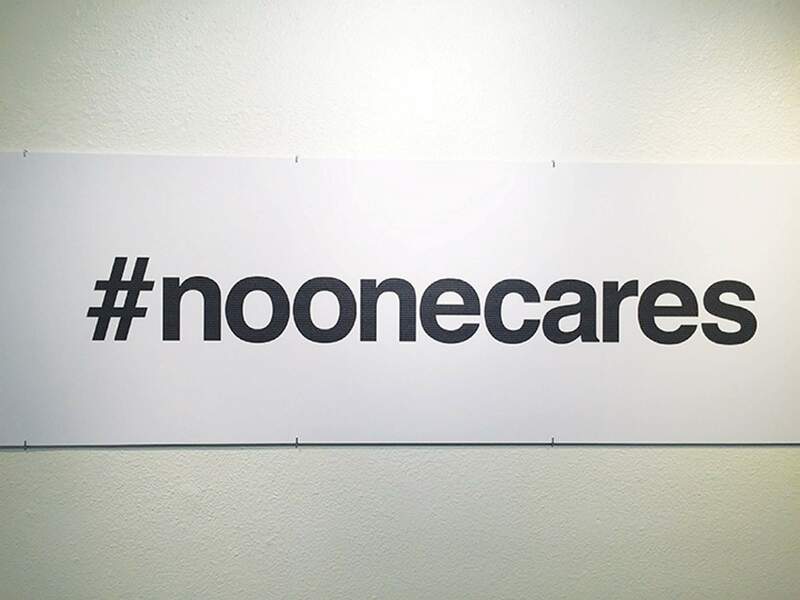 “#noonecares,” a digital print/poster by Paul Booth, is on display as part of the Fort Lewis College Faculty Biennial: Studio Art & Communication Design. A new, lighter-than-air wall sculpture by Jay Dougan anchors the Fort Lewis College Art Gallery exhibit this month. Centered on the west wall, “R.W. Quilt” is a pristine visual puzzle. Created on a 3D printer, the PLA filament work is one of many high-concept pieces in a beautiful and provocative faculty show. You owe yourself a trip up to the mesa before the exhibit closes Sept. 27. Inspired by his grandmother’s life-long quilting practice, Dougan has extended his own interest in pattern and perception. Read his statement, and all the others in the gallery book, and you’ll understand something about inspiration and process. For a man fascinated by the possibilities of 3D printing, Dougan’s elegant transformation of quilt patterns into a wholly new format is nothing short of stunning. “The Sketchbook Habit,” is a display of several workbooks by Susan Moss. 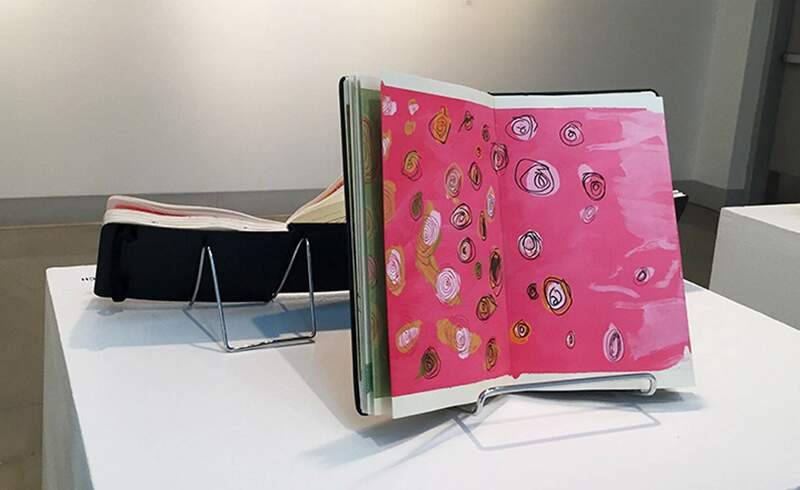 Every work in the Fort Lewis College Faculty Biennial: Studio Art & Communication Design show demonstrates a similar transformation – from Susan Moss’ deceptively simple display of sketchbooks – daily exercises in the art of seeing, to Sandra Butler’s funky, bold interpretation of a barbed wire-ringed well that sprouts a tubular growth with dry, crusted blossoms. Emblematic of nature’s struggle to thrive, the work apparently grew out of Butler’s experience the summer of the 416 Fire. Amy Wendland’s elaborate project grew out of a collaboration with Ross A. McCauley in the FLC Biology Department. “One person’s scientifically invalid trash is another person’s treasure,” Wendland writes in a big poster announcing her reimaging of old herbarium archives. The Wendland/McCauley project delves into old botanical specimens, faded labels and fresh, often humorous, illustrations. Only three are on exhibit. 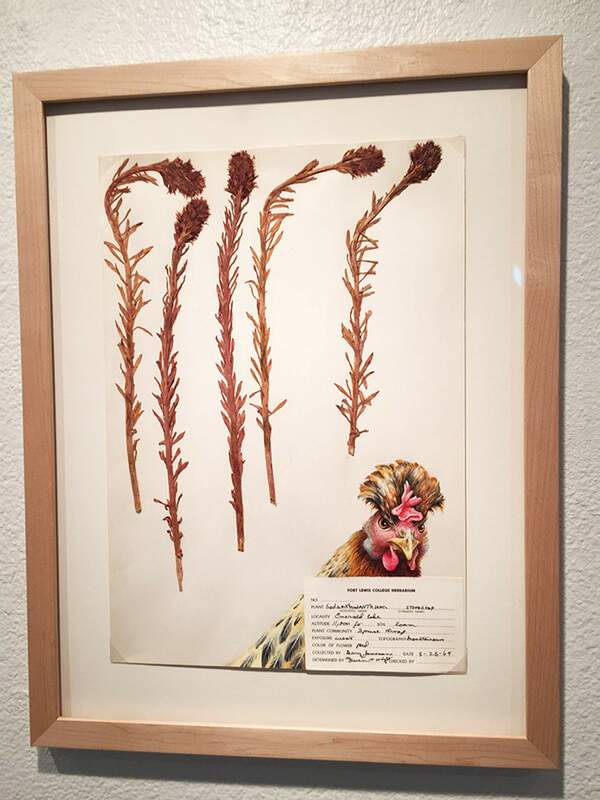 “Stonecrop, a Crested Chicken Interferes,” is made up of repurposed herbarium specimens with drawing by Amy Wendland. “Stonecrop, a Crested Chicken Interfering” positions five dried stalks above Wendland’s illustration of an angry chicken. Revived and repurposed, those old herbarium files just got a new life. Show us more. Paul Booth’s blistering digital poster “#noonecares” is visually forceful and built on the idea that strong design can change minds. Look closely at the hashtag slogans embedded in the extended word and you’ll get Booth’s double-punch to the gut. “Design communication is a form of power,” he writes in his statement. That concept smacks home in this singular work and one around the corner by colleague David Cahoon. “Sky Mall” is Cahoon’s deceptive title for this one-word collage of all the junk you can buy from an airline magazine. As simple, blunt and to the point as Cahoon’s signature piece is, Anthony Carton’s digital prints are mysterious. In dense designs of small hexagons, Carton traces a different path in each work. His title, “Cape Girardeau Missouri to Cairo, Illinois,” suggests an abstract narrative of a trip. But who knows? Works by printmaker Tony Holmquist and painter Chad Colby are presented in traditional media, but they also suggest a convoluted process from idea to finished work. Colby’s semi-abstract oil paintings brim with color and gesture plus splashes of light. His titles position his works broadly in the landscape tradition. Moss’ two rambling hand-stitched textile pieces appear to be musings, not unlike her sketchbooks. Way outside the tight confines of so much textile art, Moss’ four-panel still life of goblets and a humorous take on a kitchen experience put her out there on the border of where humor meets discovery. Judith Reynolds is an arts journalist and member of the American Theatre Critics Association. WHAT: Fort Lewis College Faculty Biennial: Studio Art & Communication Design. WHEN: Through Sept. 27. Hours: 10 a.m.-4 p.m. Monday -Thursday. MORE INFO: Visit https://bit.ly/2N7dXxp or call 247-7167.